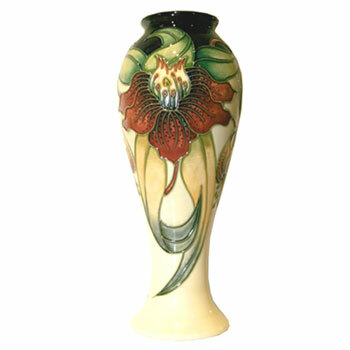 Moorcroft Anna Lily 75/10 Discounts Apply ! Designed by Nicola Slaney Featuring the popular Tiger Lily, with its magnificent stamens elegantly stylised. This design with rich red flowers green and yellow leaves on a white background with dark blue top. This is a design has been in the catalogue for a while now but is still a popular piece.